The Land Trust protected the 151 acre Camp Polk Meadow Preserve in 2000. Located near Sisters, Oregon, the Preserve contains approximately 1.4 miles of Whychus Creek with wetlands, meadows, aspen groves, and ponderosa pine stands. Restoration at the preserve, begun in 2009, involved re-constructing a meandering channel through the meadow and grading floodplains to allow for dynamic channel and floodplain habitat to develop over time and high flows. Over 200,000 native plants were planted as part of the restoration project. Camp Polk Meadow Preserve now provides high quality complex aquatic and terrestrial habitat across the valley floor. 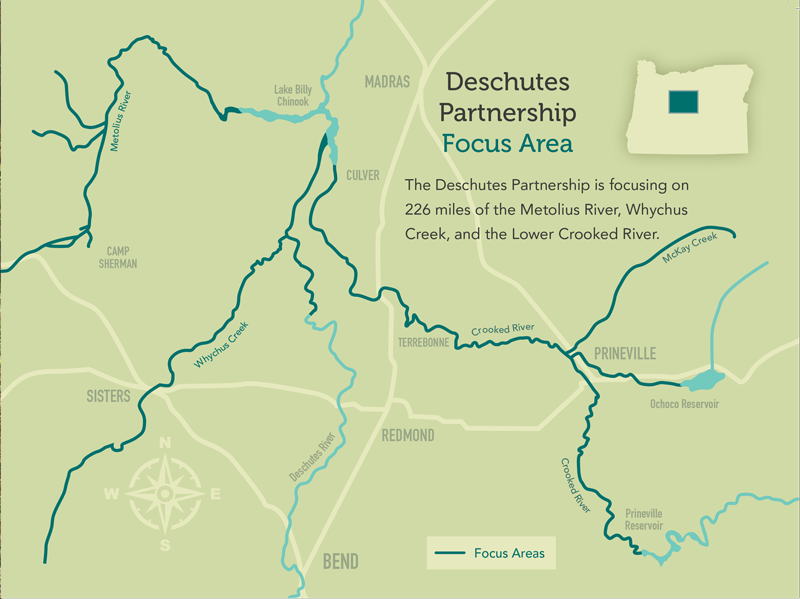 As part of a watershed-scale restoration effort, the Upper Deschutes Watershed Council (UDWC) and the City of Sisters are working together to enhance and restore Whychus Creek in the developed reaches that flow through the City of Sisters. Decades of urban development have encroached upon the floodplain along much of Whychus Creek flowing through Sisters, resulting in channelization and extensive use of rip-rap along the channel banks. Once implemented, the plan will result in restored fish passage to help ensure upstream and downstream access to high-quality habitat for both resident fish species and reintroduced steelhead and Chinook salmon, along with improved instream and bank habitat that will be resilient and self-sustaining over time. Removal of the Pine Meadow Ranch Dam along Whychus Creek upstream of Sisters made a 170 acre floodplain restoration project along 1.25 miles of Whychus Creek possible. This floodplain project along with others like it in the Whychus Creek watershed are allowing the creek to access its historic side channels that in turn create a range of complex habitat for fish and wildlife. Sand bars, gravel, cobbles, deep pools, large logs and boulders and a diversity of trees and shrubs provide food, shelter and water for many species. The collaboration with local farmers, the Deschutes National Forest, the Deschutes River Conservancy and the Upper Deschutes Watershed Council is restoring floodplains, improving salmon habitat while providing reliable water for farms. Since 2005, the Deschutes River Conservancy (DRC) and Three Sisters Irrigation District (TSID) have partnered to restore streamflow to Whychus Creek by piping TSID's main canal, reducing seepage and evaporation loss. TSID dedicates the conserved water to instream use through Oregon's conserved water statue. The resulting instream water helps meet DRC's flow target - the state instream water right - from April to October each year and improves conditions for steelhead and redband trout. The education program of the Upper Deschutes Watershed Council (UDWC) has connected hundreds of students to our rivers and streams this fall. High Desert Middle School, Pacific Crest, Buff Elementary, Buckingham Elementary, and the new Skyline High School are just a few of the schools they have engaged in hands-on, inspiring, and active outdoor learning projects. With all of UDWC's educational activities, the primary goal is to help students develop a healthy sense of place and an informed sense of stewardship. The Land Trust acquired and protected the 130 acre Willow Springs Preserve in 2017. The Preserve includes one mile of Whychus Creek, creekside meadows, aspen and cottonwood stands, and rimrock cliffs. The Preserve is located outside of Sisters, Oregon (see map below) and is home to a host of wildlife species including salmon and steelhead, mule deer, rocky mountain elk, raptors, and numerous songbirds. The Land Trust and Upper Deschutes Watershed Council are working together to explore restoration opportunities at the preserve that will enhance aquatic and terrestrial habitat across the floodplain. With funding from the Oregon Watershed Enhancement Board, a restoration design will be completed in 2019. Providing fish passage at Opal Springs is a key action to support reintroduction in the Upper Deschutes Basin, and in particular the Lower Crooked River. It is the second highest priority passage project in Oregon, only behind the Hell's Canyon complex. The 25-foot diversion structure is located at the bottom the watershed in an 800-foot deep, basalt-lined canyon near Culver. It currently blocks access to over 125 miles of Crooked River steelhead and Chinook salmon habitat. Construction of a fish ladder commenced in May 2018, and is scheduled for completion before the end of 2019. In September of 2018 The Crooked River Watershed Council signed a partnership agreement with the Natural Resources Conservation Service to initiate the Lower Crooked River Strategic Restoration Project. The Lower Crooked River Strategic Restoration (LCRSR) is a comprehensive project intended to address degraded fish and wildlife habitat, water quality, and riparian plant communities over 17 miles of the Crooked River in Central Oregon. Proposed restoration activities include both instream and riparian restoration to improve habitat for fish and wildlife, water quality, and agricultural productivity. The Deschutes River Conservancy is working on restoring natural flow to McKay Creek through the McKay Creek Water Rights Switch (the Switch). The Switch allows landowners from river miles 6 to 12 to trade their private McKay Creek water rights for Ochoco Irrigation District (OID) water rights, sourced from Prineville Reservoir. In exchange for more reliable OID water, landowners will transfer 11.2 CFS of certificated McKay Creek water rights instream. Restoring the natural hydrograph in this reach of McKay Creek will address many limiting factors, including low flow, altered hydrology, high water temperature, and impaired fish passage.